Flower A Day Stitch Along [H1916] - $13.00 : Yarn Tree, Your wholesale source for cross stitch supplies. 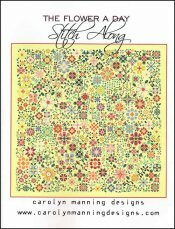 Cross stitch pattern by Carolyn Manning Designs. Look at all of the bright & wide variety of flowers blooming. Know somebody who loves to grow flowers? What a great design to stitch for them! Stitch count 225w x 223h.